Pavel Haas was born into a wealthy and prominent Jewish family in the Moravian capital of Brno. This was a city with a rich cultural life, and it was during Haas' childhood that Leo Janáček established himself as a leading figure, both regionally and nationally. Haas became an important composer of theater and film music, composing music, for example, for Karel Ĉapek's infamous RUR (Rossum's Universal Robots). During this period he worked several times with his brother, Hugo Haas, who became a successful actor in the United States after the war. The war years severely limited Haas' professional development, and in 1941 he was sent to Terezín. Although at first he was too ill and depressed to compose, he later became part of the rich musical life of the camp, writing several works that are considered classics of that time. He was deported to Auschwitz in mid-October 1944 and immediately killed. A compositional prodigy, Haas studied at the school of the Philharmonic in Brno until he was drafted into the Austrian army in 1917. He remained in Brno during that time, and in 1919 he began the serious study of composition at the Brno conservatory, working with Jan Kunc and Vilém Petrželka. Later (1920-22) he became a part of the master class of the conservatory led by Leo Janáček. As one of the only cultural figures in Moravia to have achieved international success, it is impossible to overestimate Janáček's stature or his influence in Brno and Moravia more broadly. Although Haas clearly went in his own direction, Leo Janáček's effect was profound. Starting in his early 20's, Haas was a prolific and versatile composer who drew on the leading trends of the time. The 1930's was a great age of Czech cinema, and one of its leading figures was Haas' brother Hugo. During this period Pavel Haas wrote several notable scores for both stage and film, and reached his maturity as a composer in the mid-1930's with such works as the opera The Charlatan, String Quartets 2 and 3, and the Suite for Oboe. A major work from this period, a large symphony, was left unfinished and completed only after Haas' death. When Czech society began to break down under the pressure of the Nazi presence, Haas, like other Jewish composers, took whatever steps he could to protect his interests. In this case, this included divorcing his wife in order to shield her from anti-Semitic policies. Haas was deported to Terezín in 1941. 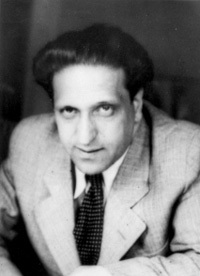 Reports of Haas' life in Terezín usually include the information that Haas was ill and depressed upon his arrival and only returned to some kind of creative productivity when the energetic and intrepid Gideon Klein put several sheets of blank music paper in front of him and urged him to return to his work. While in Terezín, Haas wrote several works including, most notably, the Study for Strings, immortalized in a clip from the 1944 Nazi propaganda film created to show the camp as a kind of idyllic spa for Jews. Here we see the composer sitting nervously and finally taking several stiff bows. Conducted by Karel Ančerl in the film, this work was successfully revived after the war. Among his greatest works, composed during his last year in Terezín, are the Four Songs on Chinese Poetry. A mature composition, written on many different levels, the cycle was performed in a concert in June of 1944. It was likely clear to any of the more highly placed prisoners that, as soon as the Red Cross visit and the propaganda film had been completed, there would be no reason to protect any of the long-term internees. By the end of the summer things had begun to change, and huge transports started at the end of September 1944. On October 16th, Haas was placed in a transport with other Terezín composers Klein, Krása, Ullmann, and Karel Ancerl. According to Ančerl's testimony, Haas, along with Ullmann and Krása, was immediately gassed. From his earliest period, Haas showed an equal affinity for abstract music and music based on text. The most formative influence on his music was the compositional legacy of Leo Janáček. Janáček's dramatic intensity played a role in Haas' artistic development, but also his use of short motives and his use of Moravian musical elements. Haas also had an affinity with Hebrew chant and incorporated these along with neoclassic and jazz idioms. This integration of Janáček's style with his own mature voice can be heard most notably in such works as the 1938 Suite for piano, in the String Quartet #3, with its synthesis of local and international musical elements, in the Suite for Oboe and Piano from 1939, and of course in the great dramatic work of his maturity, The Charlatan. Here we have a compelling combination of surface and depth, immediate charm and subtlety. These elements also seem to have been present in a powerful blend in Haas' incomplete symphony, posthumously completed. For example, in the final variations movement of the 3rd quartet we have Beethovenian depth, Janácek's aphoristic approach, Moravian rhythms and references to Jewish folk tunes. This deepening of Haas' approach continued while the composer was in Terezín, reaching its apotheosis in the Four Songs on Chinese Poetry. Here there is a kind of ideal, if agonizing and tragic, synthesis. These songs of love and longing for home seem to capture the mood of Terezín as much as any other compositions. Set as a series of interior monologues, and making periodic reference to such things as the Czech historical chorale St. Wenceslaus, the cycle offers us an affective world poised between life and death, between affirmation and complete despair. Haas seems to have a kind of personal relationship with the St. Wenceslaus melody, a tune used literally hundreds of time by composers in the Czech Lands over the centuries. It is present in the incomplete symphony, and used several times in the Suite for Oboe and Piano. The songs from Chinese Poetry also refer to it, obliquely in an especially poignant way.